Data security is a key concern for the vast majority of modern companies. Having your customer or financial data compromised can be more than an inconvenience, with many businesses unable to function without access to mission-critical records. Combine this with the fines and bad publicity that may come from breaching data protection laws and you can see why many organisations invest heavily in their backup systems. However, you don’t need to be part of a multinational corporation to keep your data secure. By carefully analysing your needs and examining the many backup options on the market today, it’s entirely possible to get enterprise-grade data security for a small business friendly price tag. Magnetic tape is one of the oldest technologies in computing, having been around since velour flares and The Doors were in fashion. Even modern tape systems still use fundamentally the same technology as a conventional VCR player, with data read from a cartridge by a specialised tape drive. In short, you could be forgiven for thinking that an investment in tape would be a waste of time, but you’d be wrong. Tape standards like Linear Tape Open (LTO) are thriving because they offer huge storage capacities for a fraction of the price you would pay to store the same amount on a hard drive. Read and write access can be slow from tape however, making it better suited to archiving applications that need a lot of cost-effective storage space but don’t require files to be accessed too often. Cloud storage involves uploading your data to a dedicated online storage provider, rather than keeping everything backed up on your premises. The cloud storage industry has grown enormously over the last few years, with a huge range of different payment plans and security levels available to customers. 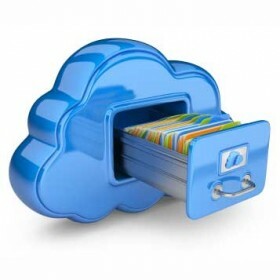 The main advantage of cloud storage is its accessibility as because your files are online, you can access them from almost any internet-connected device. Cloud also means that you don’t need to spend huge amounts of money on storage hardware and its associated management and maintenance costs. However, some cloud providers can become a target for hackers, so try to find one that offers high-level encryption services for your data and passwords to ensure that your work stays safe. Redundant Array of Independent Disks (RAID) offers just about the strongest protection you can get for your data if you decide to store onsite. A hardware RAID device is effectively several hard drives inside a casing, connected to a central processor. This processor can be configured to use these drives in different ways, from combining the capacity of all the disks to create one huge storage volume, to providing additional backups by having a master drive’s data duplicated by other drives. RAID’s key concept is redundancy. The idea behind the technology is to protect against drive failure, meaning that, in short, a blown hard drive doesn’t mean that your data is lost or even inaccessible. Some RAID types are even able to safeguard against multiple drives failing. RAID devices range in size from simple four-bay desktop units to much larger devices with 24 or even 32 bays. However, for smaller businesses a desktop unit will most likely provide all the protection you need.